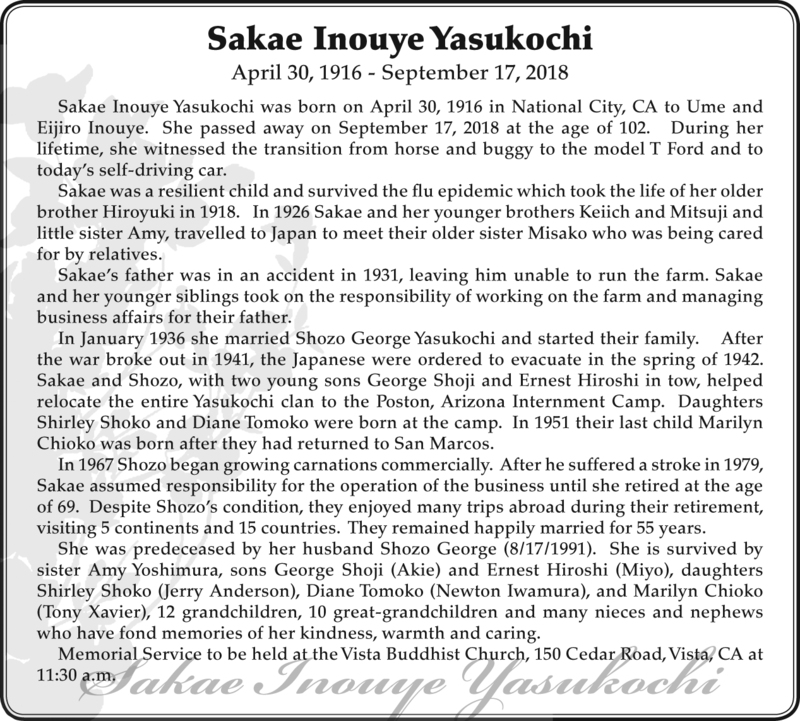 Sakae Inouye Yasukochi was born on April 30, 1916 in National City, CA to Ume and Eijiro Inouye. She passed away on September 17, 2018 at the age of 102. During her lifetime, she witnessed the transition from horse and buggy to the model T Ford and to today’s self-driving car. Sakae was a resilient child and survived the flu epidemic which took the life of her older brother Hiroyuki in 1918. In 1926 Sakae and her younger brothers Keiich and Mitsuji and little sister Amy, travelled to Japan to meet their older sister Misako who was being cared for by relatives. Sakae’s father was in an accident in 1931, leaving him unable to run the farm. Sakae and her younger siblings took on the responsibility of working on the farm and managing business affairs for their father. In January 1936 she married Shozo George Yasukochi and started their family. After the war broke out in 1941, the Japanese were ordered to evacuate in the spring of 1942. Sakae and Shozo, with two young sons George Shoji and Ernest Hiroshi in tow, helped relocate the entire Yasukochi clan to the Poston, Arizona Internment Camp. Daughters Shirley Shoko and Diane Tomoko were born at the camp. In 1951 their last child Marilyn Chioko was born after they had returned to San Marcos. In 1967 Shozo began growing carnations commercially. After he suffered a stroke in 1979, Sakae assumed responsibility for the operation of the business until she retired at the age of 69. Despite Shozo’s condition, they enjoyed many trips abroad during their retirement, visiting 5 continents and 15 countries. They remained happily married for 55 years. She was predeceased by her husband Shozo George (8/17/1991). She is survived by sister Amy Yoshimura, sons George Shoji (Akie) and Ernest Hiroshi (Miyo), daughters Shirley Shoko (Jerry Anderson), Diane Tomoko (Newton Iwamura), and Marilyn Chioko (Tony Xavier), 12 grandchildren, 10 great-grandchildren and many nieces and nephews who have fond memories of her kindness, warmth and caring. Memorial Service to be held at the Vista Buddhist Church, 150 Cedar Road, Vista, CA at 11:30 a.m.